T and K truly are the most humble, lovely and incredibly gorgeous couple and I cannot wait to capture their wedding in 2018! These folks contacted me last year and subsequently booked me as their wedding photographer, choosing a wedding collection that included an Engagement photography session – fist pump right there! 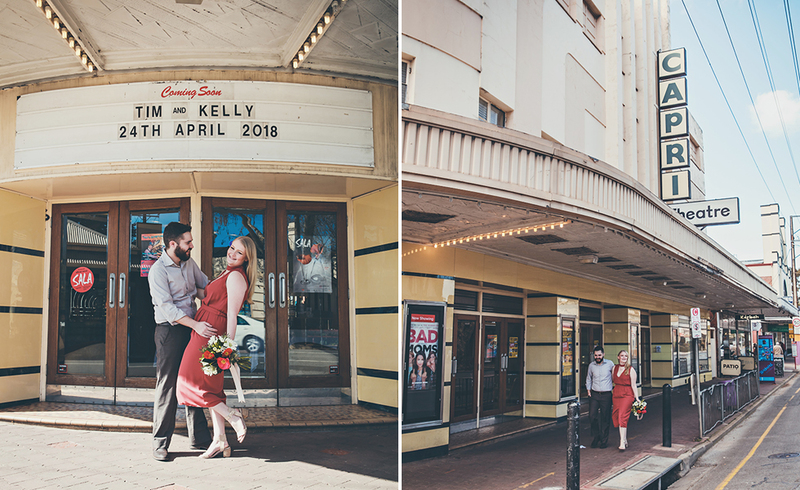 A chat about what they love to do as a couple lead us to the iconic Capri Theatre in Goodwood which we decided would provide the perfect setting for these lovebirds who love to catch a flick together in their spare time. 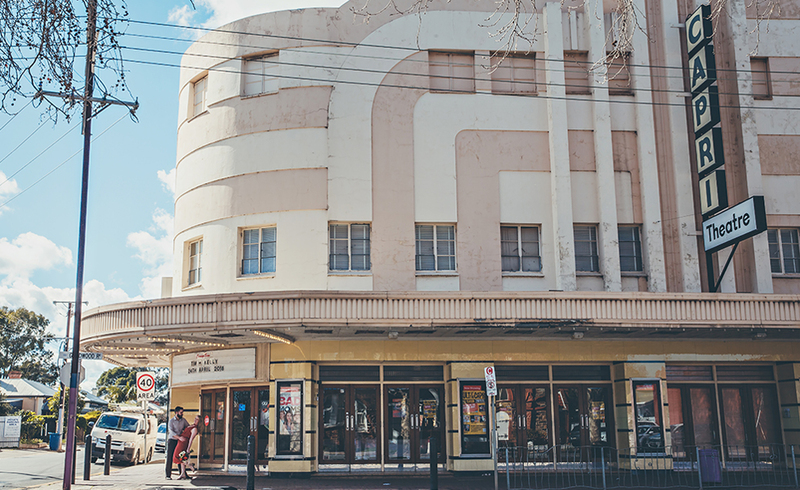 The rich moody tones of the theatre and the inclusion of some sweet props and a gorgeous bouquet by Flower Delights – Gawler Barossa Florist personalised the session and help knit the whole beautiful story together. 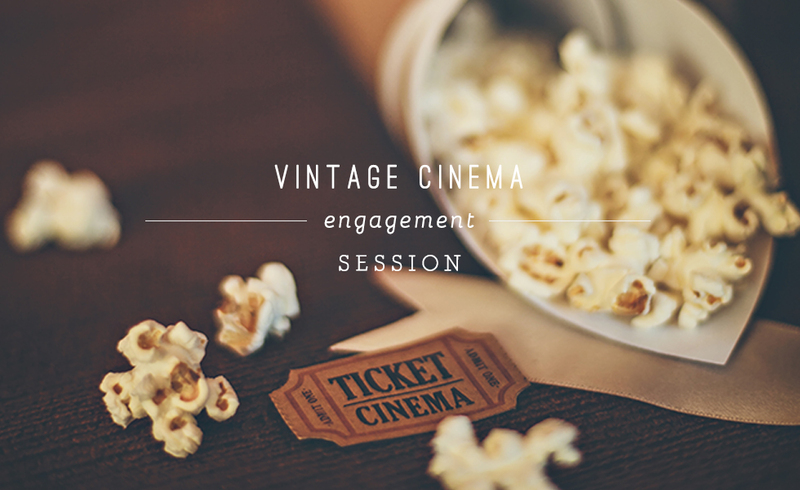 A well planned and thoughtful engagement session can be beneficial to a couple in many ways. Below I’ve listed my top 5 reasons as to why you should definitely consider one! 1. A session prior to your wedding day is a wonderful opportunity to spend some quality time with your chosen wedding photographer. They will be able to get to know you, how you are in front of the camera, what is personally flattering and most importantly you will get to know THEM! 2. Engagement sessions are also a perfect way to put your hair and makeup to the test. By scheduling your trial for the same day you’ll know exactly how your makeup will hold up and you’ll also have a visual representation of how it will look in camera and your edited photos so there are no surprises down the track. 3. Professional photos can be creatively incorporated into ‘save the date’ cards and many other printed items for your wedding which creates a unique and personal touch that only your wedding will have! 4. In my experience couples who have an engagement session are more comfortable and relaxed on their wedding day. They know exactly how the process works, have built all important trust and have a greater confidence in their photographer. The less stress you are under on the most important day of your life has to be a huge bonus right? 5. Engagement sessions are FUN! Seriously guys, the sky is the limit and you can get as creative as you (and your photographer!) dare to dream. Think about what you love to do together and use that as a springboard to capturing a truly amazing experience on your journey to becoming Mr and Mrs. Please enjoy some of my favourites from T and K’s engagement session and if you love what you see please do get in touch! Tonight, on the blog I’m taking a little journey back to a glorious Summer evening and a memorable event that I photographed in late January. When Dan asked me to capture his ‘Feels Like Home’ gig at Maggie Beer’s it was an immediate acceptance from me – such an honour! Dan is dear old school friend of mine and I’ve always watched him in awe from afar. Dan’s incredible career on the stage has taken him from Adelaide to London (and places in between! ), where he has just finished playing the role of Jean Valjean in legendary musical Les Miserables in London’s West End. The event truly was a perfect combination of fantastic food, wine and song. Maggie Beer was so lovely gracious and welcomed the guests personally. As the sun set over the water, Dan took us on a memorable and honest journey of his life and experiences through song and that impeccable voice! Enjoy some of my favourite photos from the event and my heartfelt thanks to Dan for having me! Dan’s brand new album ‘High’ is out now. You can download it on iTunes here. Anytime that I get the a chance to be creative, think big and push myself and my skills to the limit my soul literally soars! Let’s rewind to October last year, remember that week of shocking, stormy, once in a lifetime weather? Yep! I sure do! That’s because that’s when the UNEARTHED photo shoot was scheduled to take place. Unfortunately, it had to be cancelled, then rescheduled! Months of hard work, co-ordination and preparation completely out the window. Fast forward a couple of weeks and a few more challenges in between for good measure and we were presented with another rainy, albeit slightly better day. What to do? Get on with it is what…get on and do our best despite the odds. I’m proud to say that our collective best got us into the fabulous and coveted WHITE magazine blog and most importantly formed a bond between like-minded creatives that won’t be forgotten anytime soon. On my blog I wanted to share not only the standout images from the shoot but also the little snippets in between, the preparations, the vendor’s smiles doing what they love, the crew, the uniforms we had made! – all the dedicated behind the scenes moments. This is my tribute and personal thanks to the entire creative collective involved in UNEARTHED. In particular, I want to take a moment to acknowledge my fave business partner, supporter and insanely talented friend – Chelsea from Barossa Styling + Events. Together we dreamed this shoot up, together we worked our hearts out for months and together we made it all happen! Full credits at the bottom of this post Trust me, this is worth the scroll to the end! You WANT these people on your wedding dream team! An epic shoot needs an smashing uniform – yes it does! The wildly talented Sarah Craker glamming up our model Olivia in the wee hours of the morning…can’t thank her enough! Super early morning floral preparations with Bethany from VIVA. You worked incredibly hard putting together a jaw dropping floral installation on the stairs, the bouquet dreams are made of, a boutonniere and table centrepieces. Behind the scenes – styling the Bridal table. Protecting the settings from the onset of rain! Chels ‘borrowing’ a few props from the Anlaby veggie patch! The gorgeous Philippa with her little darling pony ‘Music’…we can’t thank her enough for getting him photo shoot ready and handling him on set – so grateful! It’s a team effort to get everything just right! Sarah made herself available all day for touch ups to hair and makeup and was just a fantastic help in so many ways. My amazing little crew member loving on ‘music’ once his part in the shoot was done! As far as I’m concerned, Valentine’s is as sweet a day as any to celebrate L O V E. A hug, a kiss, a love note, a bunch of blooms, a heartfelt pressie, a romantic picnic lunch – why not? In addition to spreading the love year round, V-Day can be an extra special day to spoil and thank the one that makes your heart sing. With that in mind, my dear friend Chelsea from Barossa Styling + Events set out to create a loved up Valentine’s Day shoot based around the concept of a super romantic picnic bursting with sugary goodness, pretty blooms, balloons and more. By bringing together a group of passionate industry professionals teamed with an iconic Barossa Valley venue - Chateau Tanunda, the cutest couple in town and a twirly pink tutu skirt for good measure you’ll have all of the Valentine’s inspiration you’ll need to go ahead and plan something truly amazing. Enjoy looking over these images, scrolling through to the end for a full list of photo shoot credits. Welcome to 2017 everyone! I hope the silly season didn’t get you too bad and that the New Year is off to an awesome start. I have lots of exciting shoots and projects in the works as I write this blog which I cannot wait to share with you. One of my business goals this year is to interact with all of you a lot more via the blog – offering not only a glimpse into what I’m working on but also to provide useful information for you. I’ll be covering everything from tips for Bride’s, preparing for successful family sessions and lots more. I’d like my blog to not only provide visual inspiration but to be a valuable resource and reference point for my current and future clients. For my first blog of 2017 I am sharing a beautiful family session which was shot at the end of November 2016. A bit of the backstory on this one! I first met Eliza when she modelled for a Bridal editorial shoot at Kingsford Estate in 2015 – this lady is gorgeous inside and out. Fast forward to 2016 and I was thrilled when she asked me to photograph her beautiful family of 4, including her twin baby girls. I am so lucky! The location in full and gorgeous bloom, the soft early morning light, the hand-made baby dresses made by Eliza all made for a truly magical shoot. A huge thank you also to the lovely folks at Marybank for having us.